The 1994 French Grand Prix was a Formula One motor race held on 3 July 1994 at the Circuit de Nevers Magny-Cours near Magny-Cours in France. It was the seventh race of the 1994 FIA Formula One World Championship. The 72-lap race was won by Michael Schumacher, driving a Benetton-Ford. It was Schumacher's sixth victory in seven races. Damon Hill finished second in a Williams-Renault, having started from pole position, while Gerhard Berger finished third in a Ferrari. Schumacher now led the Drivers' Championship by 37 points from Hill. Nigel Mansell made his return to Formula One, driving for Williams-Renault in place of David Coulthard. He had left F1 at the end of 1992 to race in IndyCar. Oliver Panis and Gianni Morbidelli collided on lap 29. This was the only retirement of the season for Panis. Michael Schumacher won the race ahead of Damon Hill and Gerhard Berger. Heinz-Harald Frentzen finished fourth, Pierluigi Martini was fifth and Andrea de Cesaris finished sixth. These would prove to be the last world championship points that Martini and de Cesaris (who would in fact never finish a F1 grand prix again) scored in their careers. It would also be the last time that a Team Lotus car managed to challenge for a points finish (though Johnny Herbert finishing less than a second behind de Cesaris meant it didn't actually score a point here). ^ "Motor Racing Programme Covers: 1994". The Programme Covers Project. Retrieved 21 October 2017. 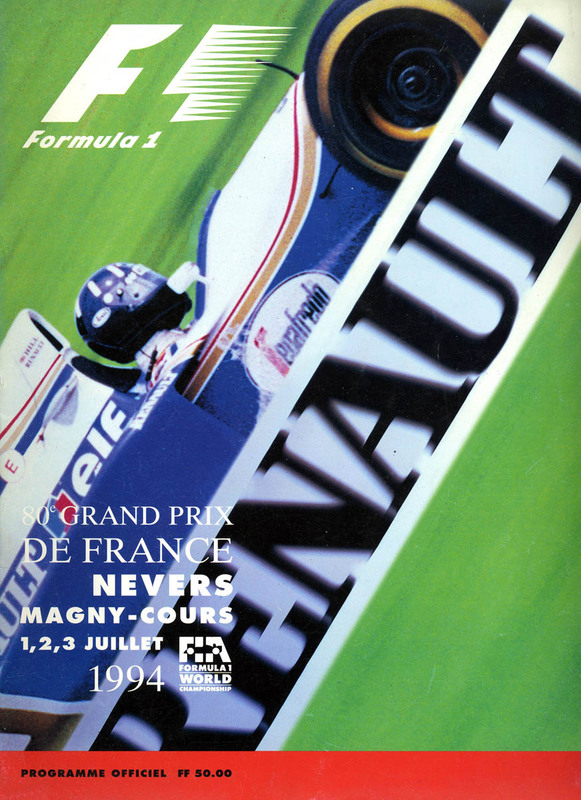 ^ "1994 French Grand Prix". formula1.com. Archived from the original on 6 November 2014. Retrieved 23 December 2015. ^ a b "France 1994 - Championship • STATS F1". www.statsf1.com. Retrieved 17 March 2019.